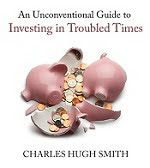 oftwominds-Charles Hugh Smith: Is Now a Good Time to Buy a House? Readers often ask, "Is now a good time to buy a house"? Here are some non-financial considerations. 1. Each potential buyer's household has a unique set of factors and conditions and thus "general advice" is of limited value. 2. The future is unknown. Given these constraints, what generalities might offer some insight to potential buyers? The standard line of thinking is mostly financial; lip-service is paid to commutes, school districts, etc., but the real analysis is all financial: is it cheaper to own than rent, how much is the "monthly nut," i.e. mortgage, taxes and insurance, how much has the house dropped from its bubble price peak, and so on. These financial factors are easily quantified: local rental data collected, interest rates and mortgages calculated, comparables (other equivalent houses in the same neighborhood sold for X), etc. But less quantifiable issues might be as important, or even more important that the raw numbers. Choosing a place to live, be it as a renter or owner, is both a calculation of finance and locale and an emotional decision: does it "feel right" or is it merely tolerable? All sorts of deeply ingrained fantasies and models subconsciously play out; is this where I want my kids to grow up? Is this likely to rise in value and provide a nestegg to pass on to our kid(s)? The "dream" of homeownership has a powerful hold on our collective unconscious, and so we should start by recognizing its grip on our imagination. 1. Security and community. Homeownership is "sold" as a financial investment first and foremost (the marketing is focused on gauzy images of "your dream home" and "baking cookies" scent PR), but the deepest human desire is for security: physical and financial. Does the neighborhood feel "defensible" in terms of having borders and a core of people who care about this particular quandrant of the Earth? I don't mean "perimeters" in terms of setting up fields of fire for an apocalyptic fire-fight with bad guys, I mean the sense that there is a community which defines itself by specific boundaries. Realtors naturally sell "the community" but this is marketing-speak for retail stores, city parks, the PTA, etc. The larger community is important, too, but a house/condo isn't located in some vague "community"--it's in a specific place with people already living there. If the neighborhood has no boundaries (as delineated in the minds of the residents or defined by geography), is mostly transients (people come and go, nobody seems to have lived here longer than a year, etc.) or devoid of any spirit of neighborliness, then it doesn't feel secure or defensible--and that suggests it won't be financially secure, either. 2. Homeowner as tax donkey. Cash-strapped cities and counties are increasingly turning to property taxes and parcel fees to raise millions of dollars, and if there are no "Prop 13" type limits on how high property taxes/fees can be jacked up without voter approval, then homeowners are a captive tax base which is ripe for exploitation: homeowners become tax donkeys, loaded up with ever higher taxes and fees and expected to stumble forward without complaint. Some might say that renters end up paying higher taxes and fees, too, as landlords pass along these higher costs, but that's not necessarily true: landlords can only pass on what the market will bear. If there is an oversupply of rentals available, then the price will be set by the market, not the landlord's costs. Homeowners are thus uniquely vulnerable to becoming tax donkeys. The mortgage might be fixed for 30 years, but the tax burdens are not. 3. Atomization and isolation. As the U.S. economy devolves, certain cultural fantasies will make less and less sense in practical terms. The primary cultural fantasy of the post-war suburban era was "bigger is better": a bigger lot, a bigger house, the more suburban the better. This is effect placed a premium on an atomized society of isolated households separated from their neighbors and from any larger community--a set of scattered households who must drive everywhere. If energy costs are likely to rise in the coming decades--and is there any possible reason to believe they will decline?--then a bigger house to heat and cool makes no sense in terms of maintenance costs. If life is set to become a little rougher around the edges in general, is basking in splendid isolation really the best source of fun and security? If gasoline won't always be cheap and plentiful, then does a totally car-dependent lifestyle make practical sense? As hospitals close and consolidate, do you want to be an hour away from whatever emergency care is still available? These are basic questions for everyone living in a country which is currently living beyond its means and thus will be "downsizing" across the board. 4. Mobility. One of the key benefits of an open economy is the ability to move to a new job. As jobs become ever more insecure and contingent, then sacrificing one's mobility by buying a house must be weighed against the odds of a forced sale/move in the future, i.e. a key wage earner in the household loses their job. The ideal locale is close to a diverse, concentrated source of employment and self-employment possibilities. The worst locale is one dependent on one industry which is vulnerable to a slowdown in the global economy. Nobody likes moving, but if it becomes necessary, it's easier to pull up as a renter than as a homeowner. There is a steep "transactional cost" to homeownership; after subtracting the realtors' fees, closing costs, transfer taxes, etc., the seller loses between 7% and 10% of the value of the property. Even if prices hold steady, buying and selling a few times can eat up 20% of whatever capital the owner had to start with. 5. Withering on the vine. Some communities are not on a positive trend line; others can look OK but beneath the surface people are voting with their feet. This is not just about how much wealth remains in the community; it's about the competence of local politicos and leaders, the sustainability of the local economy and the willingness of the residents to maintain their schools and demand accountability of the local government and industries. A passive populace with little civic interest is ripe for exploitation or devolution. A local economy dependent on real estate speculation and building new housing and malls is exquisitely unsustainable and thus vulnerable to collapse. It's easier to join a vibrant, sustainably coherent community than it is to start one from scratch or turn around a devolving one. But a vibrant civic life requires participation; you can't buy into a neighborhood and expect to be a free-rider. Is now a good time to buy a house? The decision may well rest on the confidence one has in one's source of income (the future need for mobility) and in the viability of the neighborhood and community one is considering buying into. Thank you, Stuart O. ($5/month), for your most-welcome voluntary subscription to the site-- I am greatly honored by your support and readership. Thank you, Cheryl A. ($100), for your tremendously generous support of the site-- I am greatly honored by your many contributions and by your readership.